MEET THE ARTIST : Kiki Slaughter. When it comes to heirlooms and the preservation of stories, there's nothing more important than hearing the narratives and inspirations of the makers and collaborators in your communities. We believe firmly in those people who work with their hands and master their craft, keeping it alive for another generation. 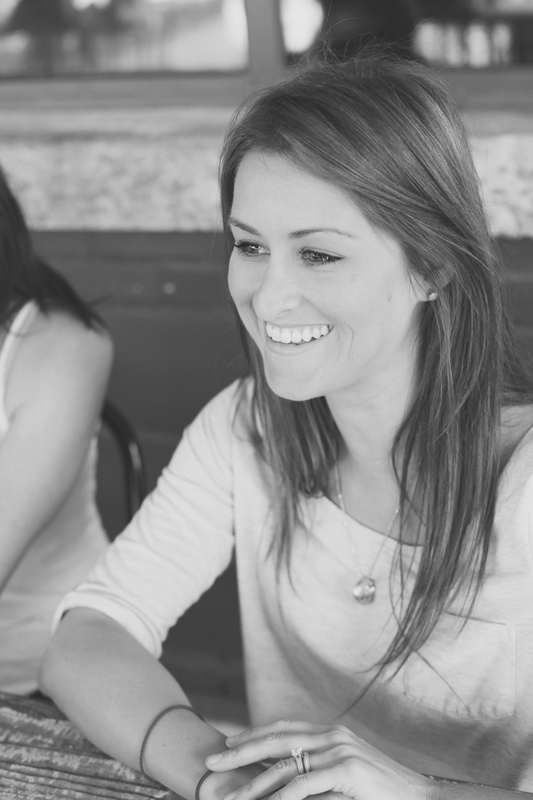 So, we reached out to artists in our community who we look to for inspiration ourselves. We asked them for insight into their creative processes, the legacy of their artwork, the importance of learning fundamental skills of a craft, and the role that their most special heirloom plays in their day-to-day. We also talked to them about our newest Studio Apron and received their design feedback. We wanted to ensure that the Studio Apron would be for artists and by artists. Kiki Slaughter has been making art since her sidewalk chalk days. Her family recognized her passion and talent at a young age and started her with painting teacher Karen Shea. Kiki's passion only grew stronger as she grew up, learning and mastering skills and mediums alongside Shea. The time she spent with her teacher was formative, but when it comes down to it Kiki has a drive that can't be taught. She is motivated by the very act of painting and combining colors and textures to create a unique composition. Kiki works primarily in acrylic and oil on canvas, and is inspired not only by the act of painting but also by her children. She says they are her "biggest inspiration and greatest works of art. They stepped up my drive and gave me a whole new purpose to create and add more beauty to the world." She is currently working toward a show at Hidell Brooks Gallery in Charlotte, opening in May 2017. It will showcase her paintings and her signature textile works. She says she's specifically excited to show her painted canvas strips, a "personal favorite" of her repertoire. It's a personal favorite of ours too because Kiki has literally been collecting these strips of painted canvas from old works from her studio and finally decided to bring these pieces back to life in a beautiful new way. They mark a history of her paintings and celebrate the trail she has taken to get where she is today. Outside of gallery shows, Kiki loves to collaborate just as much as we do. Her art has expanded now to include jewelry and wallpaper. You can wear her art now thanks to Coco Hill designer Erin McDermott, who helped turn Kiki's art into a painted jewelry line. She has also teamed up with Feathr to "create art that can literally cover your walls." We were lucky enough to go behind the scenes and into Kiki's studio, or as she likes to call it, her "painterly haven of controlled chaos." Despite attempts to organize, her studio is a beautiful mess, and she likes it that way. In the midst of creating, paint tubes and brushes often litter the counters and floor in the most beautiful way. Chaos is the mark of a true artist. 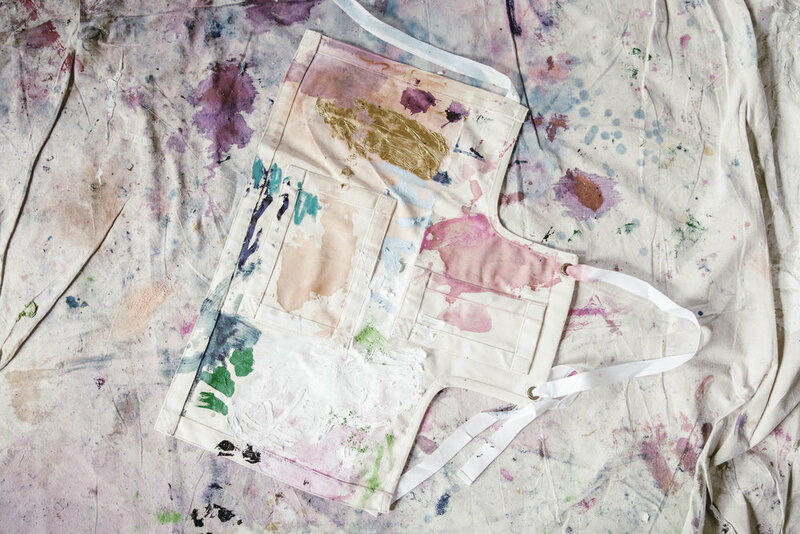 Kiki's Studio Apron, shown here in her "painterly haven of controlled chaos." When you're in Kiki's studio, you may notice a newspaper article of a little girl in deep focus, alongside some sidewalk art. That little girl is Kiki, and this photo is an heirloom she keeps close to her creative process. She says "this picture takes me back to the creative spark I felt as a child and continue to feel so strongly today. My hands still ache when I can't make something and I get all loopy when I concentrate really hard on what I am creating." She doesn't remember why the picture was taken, but she does remember being happy to focus on her drawing. "I had so much energy as a kid and my parents found that art was the best way to direct it into something positive. This moment captures the love for art that I had then and now." Click over to shop the "Apron Art" that Kiki created for us as part of the launch for our new Studio Apron!